Scientists discovered minute particles that may be from outside Earth, the Yomiuri newspaper and Kyodo News agency reported. Their components have characteristics that differ from dust or aluminum powder samples that had been collected earlier and which had been believed to have originated from Earth, the Yomiuri said without naming its sources. The Japan Aerospace Exploration Agency (JAXA) started a lengthy examination of Hayabusa's multi-layer sample canister on June 24 in cooperation with US space agency NASA. 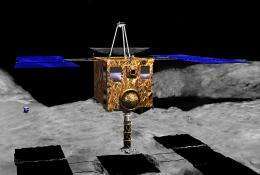 It had confirmed that scientists found "minute particles" in the pod but it was unclear whether they were contaminants from Earth or from the Itokawa asteroid which Hayabusa landed on during its mission. JAXA said it would hold a press briefing on progress in its analysis later Wednesday. It is expected to take months to get the final results. Scientists hope asteroid samples could help reveal secrets about the origins of the solar system. Hayabusa, which means "falcon" in Japanese, was launched in 2003. 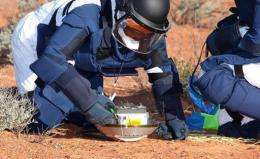 This handout photo taken and released on June 2010 by the Japan Aerospace Exploration Agency (JAXA) shows JAXA personnel inspecting the capsule carried by the Japanese Hayabusa spacecraft after it parachuted back to land in the Woomera military zone in the Australian Outback. Japan's space agency has found particles that may be extra-terrestrial in the capsule of the space probe Hayabusa. Technical problems plagued the probe's journey. At one stage it spun out of control and lost contact with JAXA for seven weeks, delaying the mission for three years until the asteroid and Earth re-aligned. After a seven-year space odyssey, the heatproof pod, fired back to Earth by the Hayabusa probe, landed in the Australian outback in mid-June. So after all this time it' still a secret as to how the solar system came into existence! Of course, that is only to be expected since the accretion theory falls so far short when it's falsified at every turn, for instance by the non-existence of the gas planets Jupiter, Saturn, Uranus and Neptune which all would have taken too long to form. Then there's the existence of retro-orbital planets and moons that cannot be explained. And talk about water on earth. And where did the moon come from? OK, enough said. So after all this time it' still a secret as to how the solar system came into existence! for instance by the non-existence of the gas planets Jupiter, Saturn, Uranus and Neptune which all would have taken too long to form. Are you trying to say those 3 planets don't exist? Then there's the existence of retro-orbital planets and moons that cannot be explained. There are no retro-orbital planets in our solar system, what nonsense. The retrograde moons are easily explained as captured objects due to their puny size and presence around massive bodies. And talk about water on earth. You mean the two most common elements in the universe comming together in a midrange of the orbital which is an expected result of accretion? And where did the moon come from? Giant impact with the earth in the early solar age. There are no retro-orbital planets in our solar system. 1) you don't know that for sure since new dwarf planets, asteroids, and comets are being discovered all the time. 2) Venus and Uranus have retrograde rotation with respect to their orbits, which is not expected. Actually, inert Helium is the second most common element in the universe, which I'm pretty sure most 4th graders know. Oxygen isn't even close. "Next to hydrogen, it is the second most abundant element in the universe, and accounts for 24% of the elemental mass of our galaxy." - From wikipedia. "The Sun... ...accounts for about 99.86% of the total mass of the Solar System. About three quarters of the Sun's mass consists of hydrogen, while the rest is mostly helium. Less than 2% consists of heavier elements, including oxygen, carbon, neon, iron, and others. - Wikipedia. So oxygen makes up less than 1% of the Solar System's mass, while Helium makes up around 23% of the Solar System's mass. Uh huh. And what crackpot invented that psuedo-science? Since a helium atom is 4 times less massive than Oxygen, this means that in terms of actual atomic count, Helium is around 92 times more common than Oxygen in the Solar System, while hydrogen is around 1200 times more common. None of which are planets. That isn't a retrograde orbit. Venus can be explained by a giant impactor as well. Uranus doesn't have enough data to determine if the rotaion is opposite or the wind flows oppositely to the rotation. Helium is around 92 times more common than Oxygen in the Solar System, while hydrogen is around 1200 times more common. You'll have to excuse me here but I meant to say "two of the most common" not the two most common. My mistake, unfortunately it was a translation error. Royal Astronomical Society Gold Medal winner George Darwin, yes, son of the same Charles Darwin writer of "The Origin of Species" and great grandson of Erasmus Darwin the forebearer of evolution.